Nokia 5: Release, Price, Specs - all info about the beginner's mobile phone! The first details on the Nokia 5 have been revealed by the manufacturer at the press conference: It runs under Android 7.0 nougat. The display is smaller than the Nokia 6 : Instead of 5.5-inch display, there are 5.2 inches. The outside dimensions are: 149,7x72,5x8,05 millimeters, the camera stands out a half a millimeter. The metal case comes in four colors (pink, blue, black, silver), with the front always black. In addition, the Nokia 5 has an antenna above and below, which should deliver good reception. The mobile phone replaces in Full HD as in the Nokia 6 in HD (1280x720 pixels). The camera is somewhat slimmed down compared to the Nokia 6 , it gets instead of 16 megapixels "only" 13. The Selfie camera receives neat 8 megapixels. A Snapdragon 430 processor is installed in the case. In addition, a fingerprint sensor is on board and there is the mobile phone in a dual SIM variant. Good: The internal memory of 16 gigabytes can be expanded by 128 gigabytes using a micro SD card. A battery with 3000 milliamper hours should ensure a proper running time. 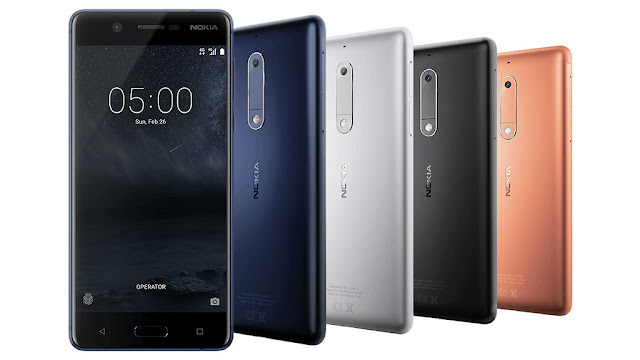 At the press conference Nokia revealed that the Nokia 5 comes for around 189 euros in stores, the Nokia 3 for 139 euros. When the devices in Germany to buy, is still unclear. If you are interested, you can already register on the Nokia homepage to be informed as soon as the smartphone is available.